AFTER a massive six point haul over Easter, all roads lead to Clitheroe’s picturesque Shawbridge ground for Brighouse Town on Saturday (3.0). Paul Quinn’s charges are still in with an outside chance of reaching the Evo-Stik NPL Division One play-offs. While Town were beating Radcliffe Borough 3-0 on Saturday, Clitheroe were seeing off Ossett Albion 2-0. However, Cliotheroe blew their play-off chances on Monday, losing their derby with play-off candidates Colne 2-1 while Town were beating Goole 2-1. 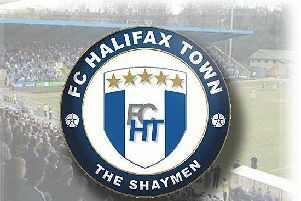 Town must win their final fixture and improve their goal difference against Simon Howarth’s side. They must also hope Colwyn Bay beat or at least draw with Scarborough Athletic, Ossett Town beat Trafford and Lancaster City go to Glossop North End and win to take the title. Lancaster and Scarborough have the longest trips of the day and know what they have to do with the Dolly Blues keen to win to pip second-placed Farsley Celtic, who drew 2-2 at Colwyn Bay last Saturday and then lost 2-0 to Ossett Town on Monday. Quinn said: “ My message to the players after the Goole game was simple; all we must focus on is our performance on Saturday. We can’t afford to get caught up in the ifs, buts and maybes. Chairman Charles Tolley said: “Whatever happens, I could not be more proud of the players, management team, club officials and supporters for their efforts this season. Town’s only injury worry is midfielder Jack Stockdill, who injured a knee in a tackle at Radcliffe Borough on Saturday and missed Monday’s home game with Goole.